Credit Card Interface | Innsoft, Inc.
Innsoft has partnered with Zeamster and Fortis Payment Systems to offer a fully-integrated EMV solution for Check-Inn. Processing cards using the EMV chip will greatly reduce the risk of credit card fraud. Save time and money, while increasing security. Innsoft has further increased security by introducing credit card tokenization. By using Zeamster as your gateway credit card data is no longer stored in Check-Inn, simplifying your PCI compliance. For more information on how tokenization works view the tokenization diagram. Innsoft currently offers two terminals. The PAX S300 and the PAX S80. 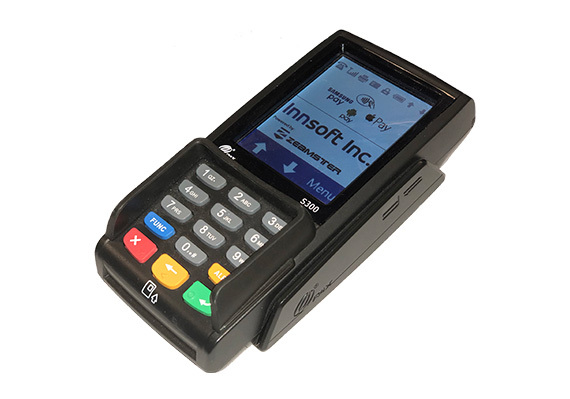 Innsoft recommends the touchscreen PAX S300 terminal (Shown in picture). Both terminals offer contactless features including Apple Pay, Android Pay, Google Wallet, etc. Call Sales today to learn about terminal and interface discounts. Fill out our online form for a confidential statement comparison by Fortis Payment Systems. Fortis Payment Systems offers a variety of products and services to completely meet all of your processing needs. They will perform a fast, confidential, no obligation analysis of your statement. They can determine exactly what you are currently paying and will show you what they can offer you in savings. For the best rates and enhanced customer service, you can use Fortis Payment Systems as your credit card processor! If you are interested in comparing your current credit card processor’s rates to Fortis, you can submit an easy online request form or contact us for more information. The Signature Pad for Check-Inn is a great option for any property that uses the credit card processing interface. Save money by going green! With the signature pad an electronic copy of all signed receipts and folios will be automatically saved in Check-Inn. This means you no longer need to keep boxes and boxes of receipts! Access past signed documents quickly and print them only when needed. Visit our signature pad page for more information about this incredible hardware option for your Check-Inn hotel software!